Again this year, Roosevelt School will be participating in the Box Tops for Education program. Clipping Box Tops is an easy way to help earn money for our school. Each coupon is worth 10 cents. Look for Box Tops on products around your home or office. All you have to do is clip the Box Tops and send them to school. Many thanks to Roosevelt families and staff for sending in $277 worth of Box Tops in February. Every Box Tops coupon clipped and submitted helped us reach our cumulative goal of earning over $1,000 for the Roosevelt PTO this year! Please keep sending Box Tops to school through the end of the school year. There will be one last collection drive in May. Ask extended family and friends to collect Box Tops for Roosevelt too! 1. Cut Box Tops from products with the expiration date shown. Expired Box Tops are not accepted. 2. Attach Box Tops to a collection sheet or place as many as you have in a zippered bag. 3. Send the Box Tops to school with your child. We will be collecting Box Tops all year long. 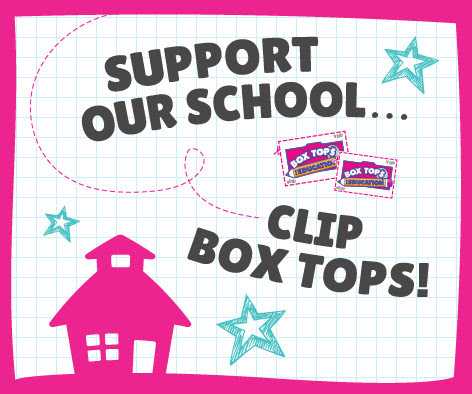 Start sending your Box Tops to school today! Remember to ask family and friends to help collect Box Tops for our school as well. For more information about Box Tops, including a list of participating products, visit the Box Tops for Education website or the Roosevelt PTO website.